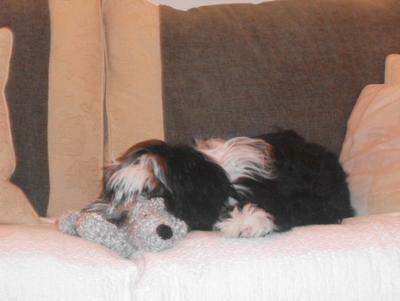 Tibetan terrier dogs are gorgeous! 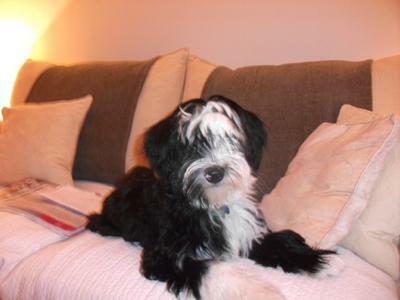 My Tibetan terrier dog Bailey came to live with us in August 2009 when he was 9 weeks old. The cutest little dog you have ever seen with his black and white markings, three white paws and one white boot he soon got all four huge paws firmly under the table. He has given our black miniature poodle hell from the moment he arrived, pulling his tail, ears, whiskers and clipping his paws, which he also does to our ankles. He quickly decided that the only person he was going to obey was my husband, and the fact that I am the one who baths, brushes, feeds and walks him doesn't seem to matter to him and I appear to be a non entity unless of course I have chocolate and then he won't leave me alone. Although chocolate should not be given to dogs it is a very good bribe to entice him back in when he is outside pruning my garden which he does frequently, only yesterday he brought me the root of a fuschia bush which had only been planted in the summer. He is now 18 months old and has developed from a cute little puppy into a beautiful looking dog with the most gorgeous expressive eyes you have ever seen. It has to be said that although better behaved now he is still very naughty hence the name Tibetan terror which is much more apt than Tibetan Terrier. His latest antic is to climb up on the back of the settee or chair curl up and watch people walking past the house. He has also adopted a stool in our kitchen which he sits on whilst we are eating although not to beg for food just to be part of what is going on. He absolutely loves the current weather we are having to the point that he recently went outside for two hours and slept in the snow. This Tibetan dog is the most naughty, unusual little dog that I have ever owned, but at the same time the most intelligent and he is so so pretty, and although I came close at one point to sending him back to his breeder as wasn't sure I could cope with the behaviour I now would not be without him.